Over on the Burning Blog, our friend Evil Pippi explains in detail how Krug Champagne exploited the Burning Man 2011 event with a publicity stunt where they staged a photoshoot in the form of an elaborate dinner party by the trash fence, with food prepared by NYC chef Phil Winser of The Fat Radish. The feast was setup in order to promote their champagne and they invited “society bloggers” to cover the event, which was written up by Notes on a Party and Taryn Cox The Wife. The event was also featured in serveral publications including Town & Country and W Magazine (since removed). Krug, a centuries-old luxury champagne house, and its publicity machine, staged and hosted an elaborate dinner party at the trash fence on Friday night of the 2011 event. Pre-event, Krug’s PR agency pitched members of the media to photograph and report on the staged dinner for publications such as Town & Country and W Magazine. They invited society bloggers to the “exclusive” champagne dinner with the expectation of getting even more coverage, and pro photogs to shoot it. And it worked. 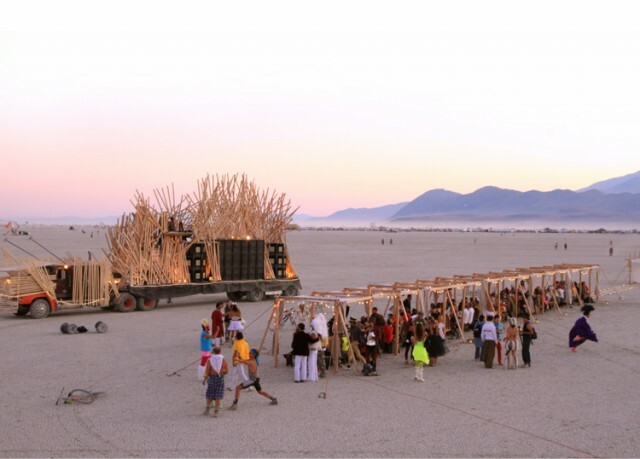 The organizers of this event brought paid photographers to the playa and had them falsely register with Media Mecca saying they were there to cover general art and playa happenings, instead of telling the truth; that they were there to act as representatives of Krug – obviously knowing that if they had told the truth, they would not have been allowed to photograph. They then pulled the dinner off entirely under the radar, had the dinner covered both by their captive media and the general media, and managed to get product placement articles published. Burning Man has always been a non-commercial event and all media has to be approved in advance via the Media Team at Media Mecca, which Krug went out of their way to circumvent. Making things worse, they did not clean up after the dinner, leaving the table, food and trash on the playa for others to clean up, an affront to Burning Man’s long standing policy of “leave no trace”. Of course at this point the damage to their brand will end up being much greater than the promotion gained by their stunt. 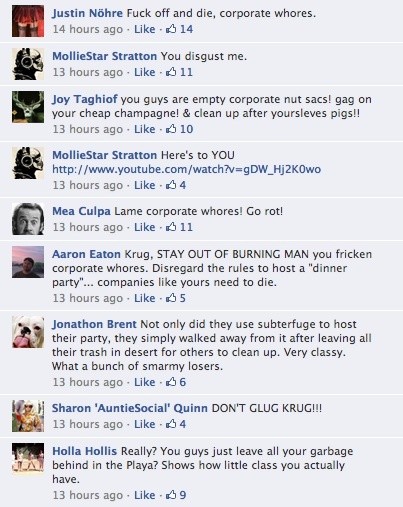 The Burning Man community is outraged to say the least and has been going after Krug on Twitter and Facebook. The story has also been picked up by MetaFilter, SFist, Inside Scoop SF and Burners.me. UPDATE: Bret Bernhoft has written up a really great case study and timeline of the Krug Champagne Burning Man PR Meltdown.